In a video that has garnered over a million views on YouTube, the beer giant Kingfisher ‘introduced’ the newest, simplest, and by far the greatest way to be the ‘king of good times’. 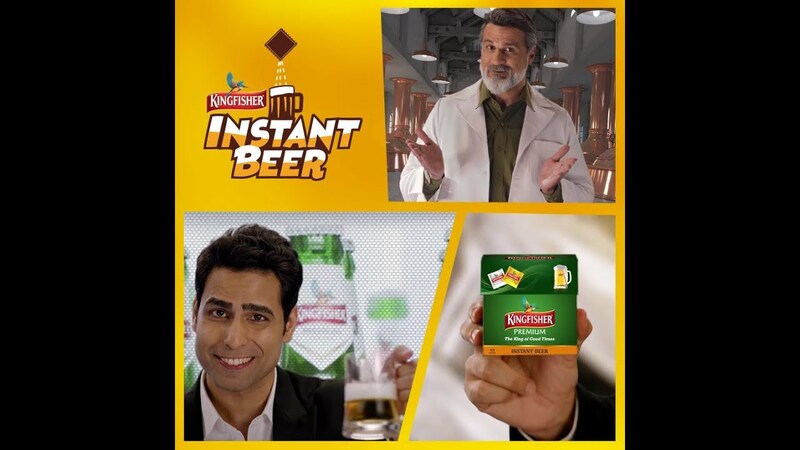 With a swanky and rather convincing production, they debuted their latest innovation – Kingfisher Instant Beer that can be made anytime, anywhere. How does it work? Well, two sachets of ‘beer powder’ and ‘carbonation powder’ combined in cold water give you the same Kingfisher experience you know and love, in an instant. The only problem, however, is that it’s too good to be true. The video advertisement was released on YouTube on March 30, a good two days before April Fool’s day, which helped sell the gag. In fact, at no point during the tongue-in-cheek video do they reveal that it’s a hoax. They just leave it up to the viewer to figure it out by revealing the release date as April 1st. Sure there was a Kingfisher Instant Beer microsite set up with more information (which has since been taken down) and tons of comments on the video from gullible folks who were more concerned than happy. One user posted a very pertinent query, “It’s alcohol content is what?”, while another asked, “where it will be sold it is sold in wine shops how much cost?” (you may need to read that one twice). The jig was up pretty early on though, with many figuring out that it was indeed an April Fool’s prank. It was brutal. In fact, you could feel it in the comments, “Don’t play emotional game with me” said one, while another said, “Don’t play with our emotions…” In all fairness though, it does seem like a pretty good idea. One viewer even seemed to think so saying, “Instead of making it an April Fool joke why don’t you really work on it?” We think she’s on to something! If you haven’t watched the video yet, you can hit play and watch it below. Also, let us know what you think about this ingenious prank in the comments below. Previous ArticleNeha Kakkar bathroom pictures go viral on the internet.Next ArticleThe Ad Wars, twitter troll between BJP, AAP and Congress.